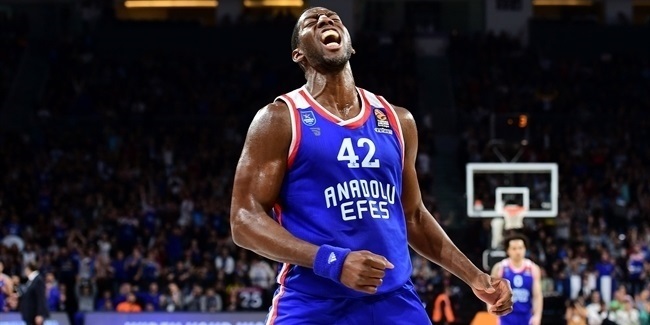 After putting together one of the more memorable rookie seasons in competition history, Bryant Dunston of Olympiacos Piraeus has been voted the 2014 Best Defender Trophy winner by Turkish Airlines Euroleague head coaches. The Best Defender Trophy is the second in a string of 2013-14 EFES Euroleague Awards to be revealed this week. Dunston, 27, stepped into a difficult role as a rookie of whom much was expected for the back-to-back Euroleague champs. He responded with greatness. Dunston earned weekly bwin MVP honors three times and led the competition with 1.3 blocks per game. He also became the first player in the Euroleague this century to compile at least 30 blocks and 30 steals in a single season. Dunston had five games where he combined multiple blocks and steals as the anchor of the Reds' interior defense, which allowed only 46.5% of two-point shots in the regular season and then lowered that number to a league-best 45.8% in the Top 16. 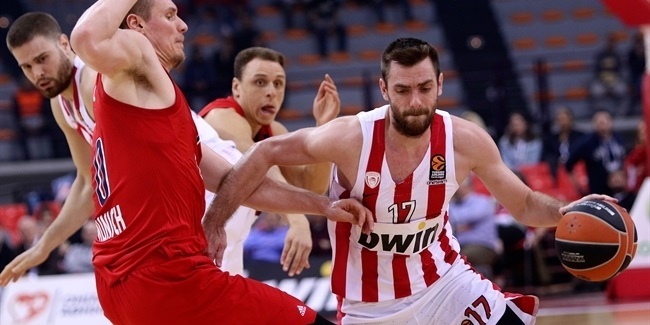 The Olympiacos defense also ranked second during the Top 16 by allowing only 71.1 points per game. Dunston's rim-protection, constant hustle and overall presence contributed to the making of many of those defensive stops. Dunston edged CSKA Moscow big man Kyle Hines in one of the narrowest races for the Best Defender Trophy in the award’s history. Dunston replaced Hines at Olympiacos this season. 2013 Best Defender Trophy winner Stephane Lasme of Panathinaikos was third in the voting. Dunston is only the fifth different player to win the Best Defender Trophy award since its inception in 2004-05. He joins six-time best defender Dimitris Diamantidis of Panathinaikos Athens, CSKA Moscow's Victor Khryapa and Andrei Kirilenko, and Lasme. The first of the EFES Euroleague Awards was announced earlier this week as Keith Langford of EA7 Emporio Armani Milan earned this season's Alphonso Ford Top Scorer Trophy. Other to be announced shortly include the Euroleague Rising Star Trophy and the All-Euroleague honorees. The bwin MVP award will be revealed at the EFES Euroleague Awards Ceremony on Thursday, May 15 in Milan. The Alexander Gomelskiy Coach of the Year Trophy and the Euroleague Club Executive of the Year are post-season awards. Dunston played college basketball at Fordham University before starting his professional career in South Korea with Mobis Phoebus, where he won the league title. He moved to Europe in 2010, first with Aris Thessaloniki of Greece, where he made a Eurocup debut, and then moving midway through that season to Bnei Hasharon of Israel. He spent 2011-12 with another Israeli side, Hapoel Holon, and last season with Varese in Italy. Dunston signed two-time defending Euroleague champion Olympiacos prior to this season and found his place under the Piraeus sun right from the start. While Olympiacos went undefeated through the regular season, Dunston made his introduction to the Euroleague scene an impressive one. In addition to establishing himself as a threat on the offensive end, he made noise on defense with multiple blocks in more than half of the regular season games. His steady presence on the glass resulted in grabbing at least 5 boards in nine of 10 games for an average of 6.3 rebounds per night in the regular season. His first flash of dominance was in the third round of the campaign, when he won his first weekly bwin MVP award with 19 points, 8 rebounds, 3 blocks and 2 steals against Bayern Munich. Two weeks later, he blocked 4 shots against Stelmet Zielona Gora, and in a span of five games Dunston racked up an impressive total of 15 blocks and 6 steals. 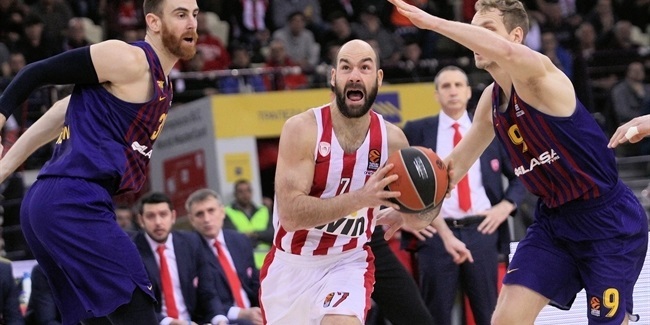 He played even more physical in the Top 16 on both ends of the floor, and that led to five more games with multiple blocks, and Olympiacos being the best two-point shooting defense in the competition. Despite averaging almost 25 minutes per game, while constantly banging inside, playing physical defense and challenging shots, Dunston fouled out only once in 29 games this season - in a Top 16 Round 9 home loss against EA7 Emporio Armani Milan when his performance included 4 blocks and 3 steals. The big man contributed with 3 steals in Top 16 Round 12, too, helping the Reds to an away win against Unicaja Malaga that all but secured them a playoff spot. In the playoffs against Real Madrid, Dunston averaged 6.6 rebounds and picked up at least a steal in each game of the series. He was honored as the bwin MVP for Games 3 and 4, carrying Olympiacos and helping extend the series to maximum five games. He finished the season as team's leader in rebounds (5.3 rpg. ), blocks, steals (1.1 spg.) and performance index rating (15) and third in scoring (10.3 ppg. ).